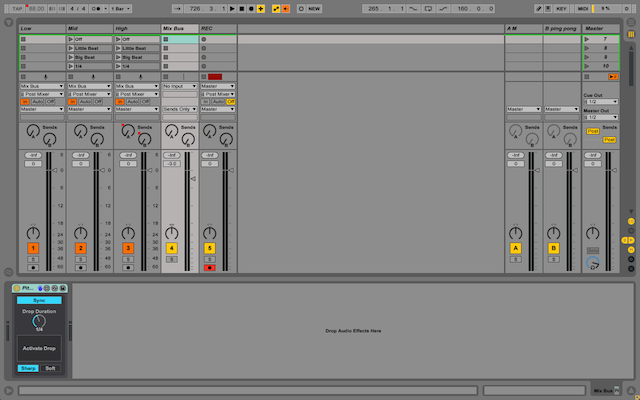 Dubspot guest blogger Josh Spoon rounds up five Max for Live devices to assist you onstage with Ableton Live. Ableton Live is already the most powerful computer program for live performance around, but somehow Max for Live developers keep thinking of ways to make it better. These five devices give you some features you’ve been waiting for, and others you didn’t even know you needed! 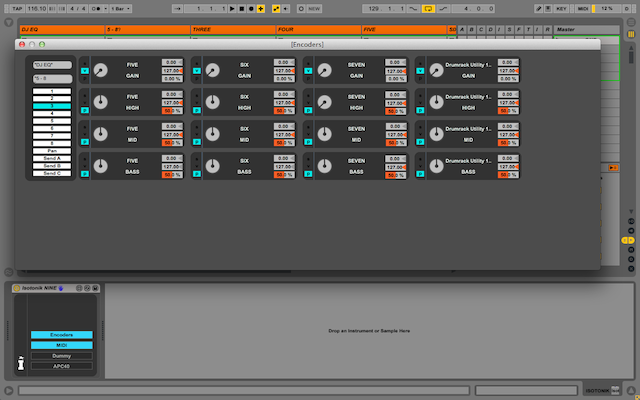 MOMENTARY_8 Pro, developed by Yehezkel Raz, is a tool that makes it easy to momentarily enable effects. This is a task that’s easy with a programmable controller, but difficult when working with a controller that only sends standard MIDI note messages (such as a Novation Launchpad), or when using the computer keyboard for remote control. Typically, you’d have to double-tap these controllers–once to turn the effect on, and again to turn it off–but with MOMENTARY_8 Pro this isn’t necessary. MOMENTARY_8 Pro also allows you to specify a minimum and maximum value for the mapped parameter, and offers a Glide option so you can automate the parameter over time. Not only is this handy device easy to use, it’s free! Isotonik 9 (£17.99 with free updates) was originally designed to enable DJ-style mixing with the Akai APC40. 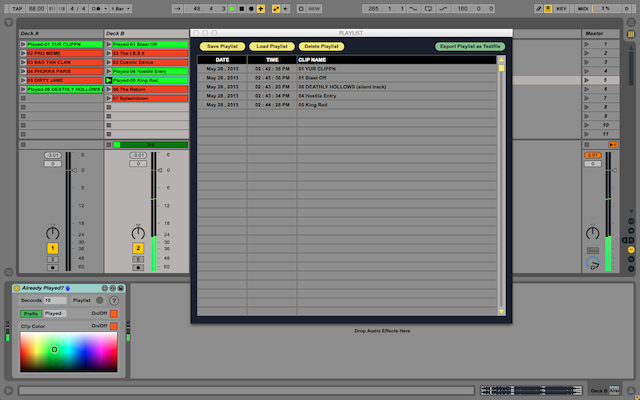 However, this suite of Max for Live devices allows you to do more than just mix. Isotonik is always taking suggestions from the community and the product has continued to grow steadily. Isotonik 9 has 8 banks of pre-mapped (but easily remappable) DJ controls like EQ, Filter and Sends assigned to the APC40′s device controls. You also get features like live looping, automatic Follow Actions, a drum pad, pitching and nudging clips, tempo control and custom mapping. Because of it’s power and robust feature set, it takes some time to understand Isotonik 9, but it’s well worth it. TEMPO, also developed by Yehezkel Raz, smoothly changes Live’s tempo over a span of time defined by the user. Before this device was created, one had to adjust tempo manually, or use a complicated workaround to automate tempo changes during performance. TEMPO has two modes for specifying how quickly the tempo change should happen. It can take from 0-20 seconds in Time mode and up to 8 bars in Sync mode. A nice additional feature is the option to launch the selected scene after Live reaches the new tempo. Already Played 1.0, developed by Mark Egloff, automatically changes the color of clips and renames them after they’ve been played. This device is great for those of us who have hundreds of clips in a Set, and may lose track of what has been played during a long performance. Designed with DJs in mind, it also keeps a playlist of all clips played so you can compile a track listing after the gig. This feature makes it easy to go back and find great songs and clips you mixed. Pitch Drop, one of the Max for Live Essentials, is a simple device that simulates a record stop. You can set the Drop Duration from 1/64 to 8 bars in Sync mode and up to 20 seconds in Time mode. There’s also Sharp or Soft modes for specifying how smooth or abrupt the drop is. It’s fun to use on vocals because it sounds similar to the batteries dying on a cassette player. It also works well to place Pitch Drop on the Master track and use MOMENTARY_8 Pro to trigger quick drops. With the Drop Duration set to 8 bars, you can use it to end your show with a massive slowdown. Play with it and have some fun! Dubspot guest blogger Josh Spoon is an Ableton Live veteran, blogger, drummer, music producer and live performer. Josh has a residency with the eclectic Los Angeles electronic music collective Space Circus, performing every first Wednesday of the month, and just released his first concept EP of grooving low-end originals entitled Man on Mars.